Give an old t-shirt new life by turning it into a market tote! Seems like we never have a market bag when we want one, yet we always seem to have more t-shirts than we need. 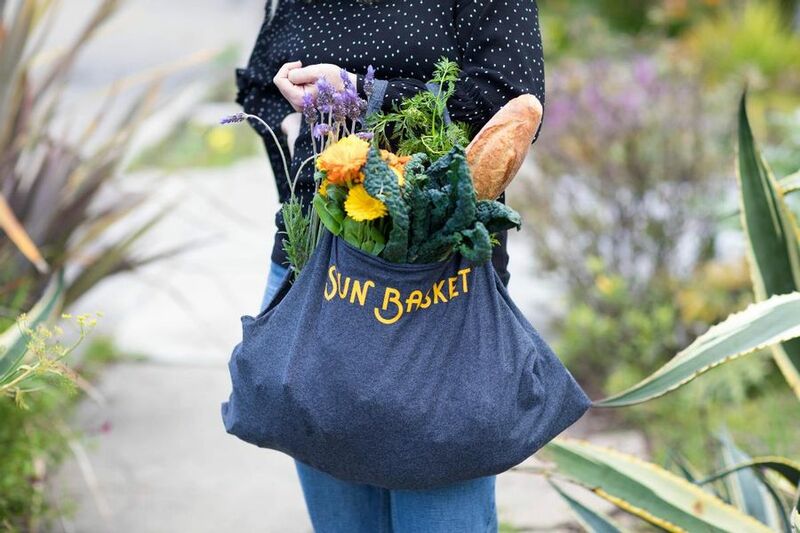 Sun Basket's DIY maven, Christina Stork, has found a clever solution with these easy-to-make t-shirt totes. With just a couple of strategic cuts and a single seam, she turns a shirt into an upcycled bag. 1. Lay the T-shirt on a flat surface or self-healing mat. Using tailor’s chalk or a felt-tip marker, trace semicircles around each arm and around the neck of the T-shirt. Trace a horizontal line across the bottom of the tee shirt 8 to 10 inches down from the underarm seams. 2. Using scissors or s rotary cutter, cut along each line of chalk or marker. What remains should look like a tank top. 3. Turn the T-shirt inside out. Using a straight stitch, sew the bottom closed about ½-inch above the cut line. Repeat with a zigzag stitch over the straight stitch, to reinforce the bottom of the bag. 4. Turn the bag right side out and head to the farmers' market.